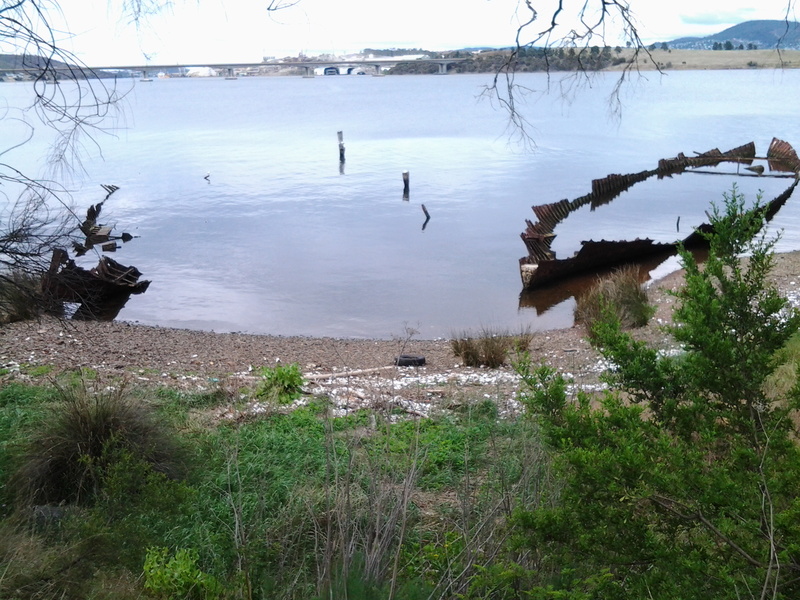 Before long I could see the water of Otago Bay, and I could see the rusty remnants of the two boats, the Otago and the Westralian. 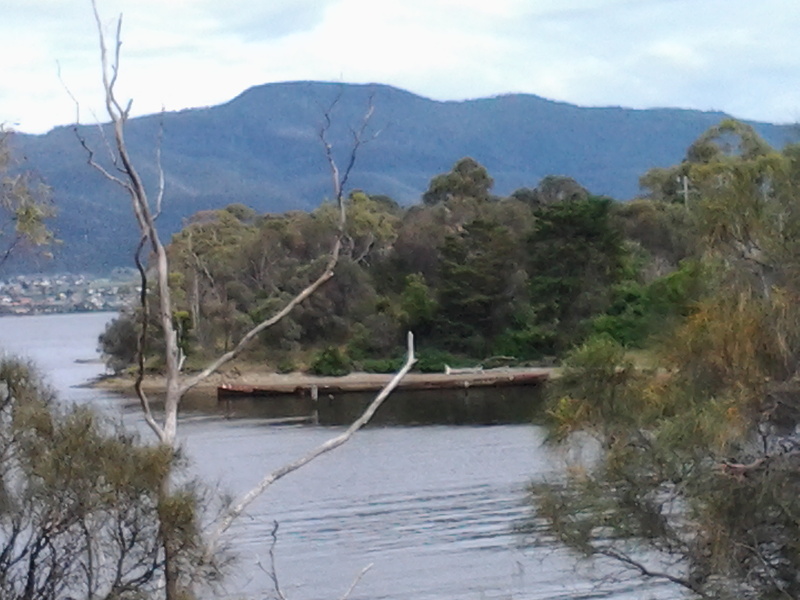 In the photo below, the low mountain on the other side of the Derwent is Mount Faulkner. Ja and her dog were lively company and walking with her was a big change from my normal solo experiences. We enjoyed photographing each other in this quiet and peaceful place and parted once we reached the interpretative panel near the sunken ribs of the two boats (Westralian on the left and Otago on the right in the photo below). I was disappointed that the main point of the interpretative panel was not to talk broadly about the history of both boats but to laud the last Captain of the Otago, the esteemed novelist Joseph Conrad. Over the road, Conrad Drive wound up the hill into a residential area. It seems the author has become most important. The Westralian is not mentioned at all so I can only imagine other visitors must leave the site quite puzzled about what they are seeing. In an earlier posting I provided detailed information about the Otago, after which the Bay and suburb have been named. The Westralian was a steam ship abandoned and cut down during the 1930s. It was 10.40am before I left the boats of Otago Bay. I walked uphill – yet again without a formal pathway so I was alert for cars travelling through. There are always ‘lead foot Larrys’ whose press on the car’s accelerator speeds them through the suburban streets as they veer unexpectedly onto whichever side of the road gives them the shortest path to whatever their destination. Could be a shortcut to God if they are not careful. This leafy gum-treed suburb is mostly high above the Derwent River and many of the houses sit with grand views. At one point I could see that I was level with the height of the Bowen Bridge in the distance. It was not possible to walk around the water’s edge and it was impossible to walk around the edge of the cliffs because access to these has been cut off by the gates and fences of private property. I stayed walking up and down and then up and then downhill on undulating Otago Bay Road. Some houses were located on 5 acre lots. 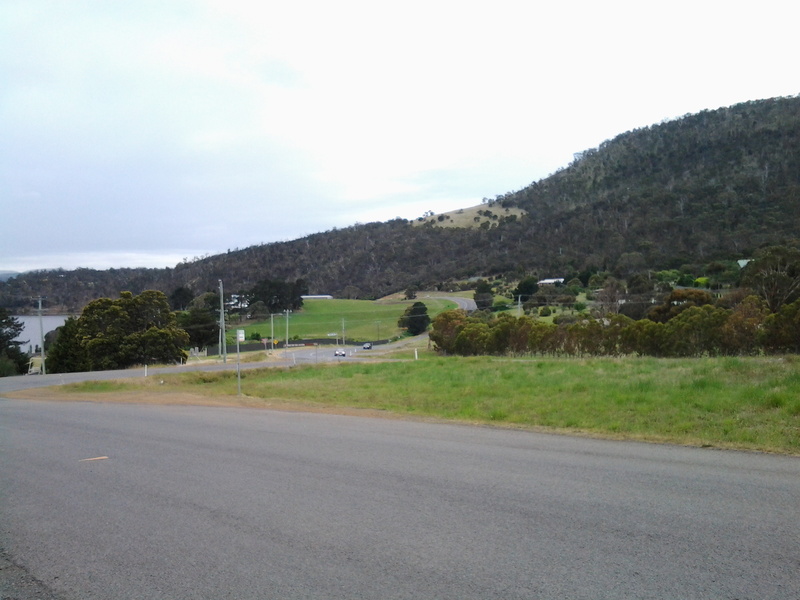 Some parts of the suburb seemed quite rural without any sign of active agricultural businesses. I passed a creek with croaking frogs and others making a soft booming bom bom, bom bom; a repetitive but very musical sound. Wild blackberry canes flourished. Sulphur crested cockatoos screamed through the trees. The sounds of so many other birds reverberated through the bush. Beautiful. Wonderful. At 11.10am, I noted a left hand road led to accommodation; the Penenjou Bed and Breakfast. I didn’t walk this road but I imagine that tourists staying out here might find the country to be very attractive and peaceful. 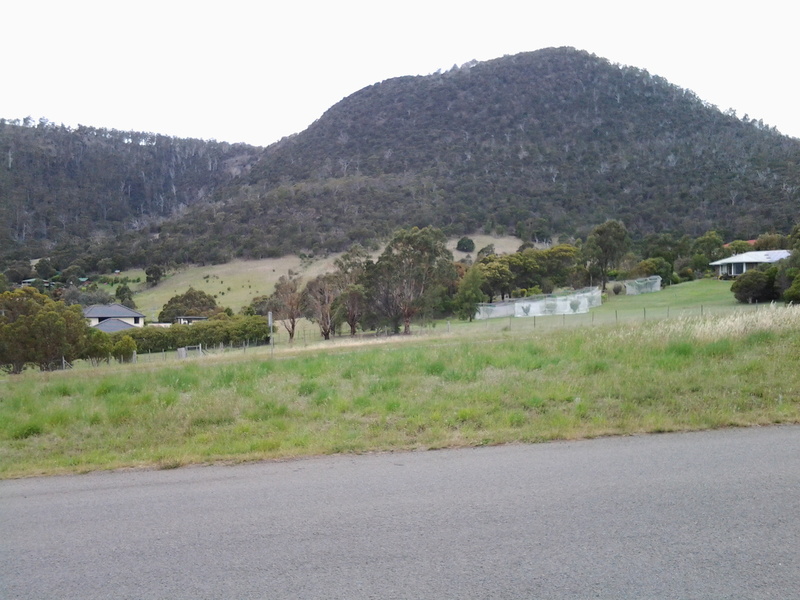 Apparently the homestead is located on a hectare of developed gardens overlooking Mount Wellington. 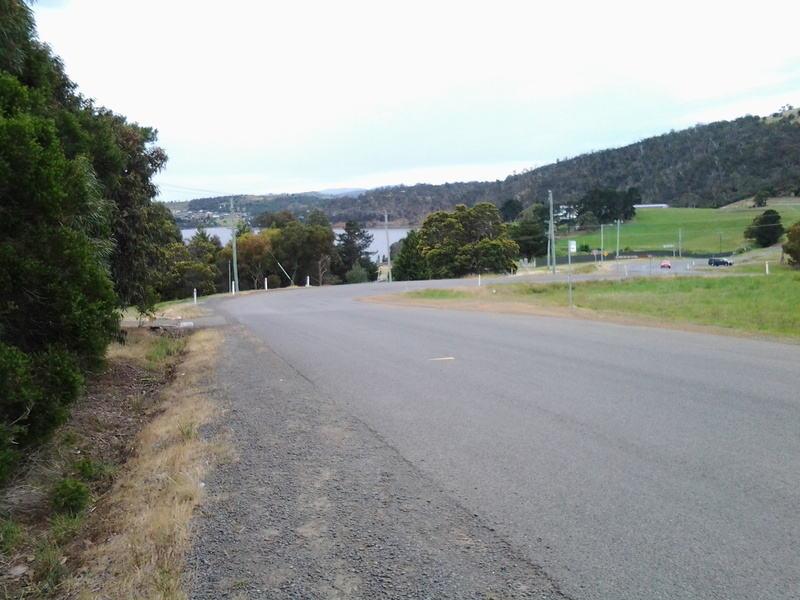 I continued walking along Otago Bay Road, close to and parallel to the Highway. At the intersection with Restdown Drive reached at 11.18am, a sign pointed to another accommodation option Otago Cottage (http://www.otagocottage.com.au/). Again, knowing this was a No Through Road, I stayed walking along Otago Bay Road. Looking inland I could see the smallish mound of Mount Direction. From experience I know that walking tracks on this mountain can be accessed from the Risdon Dam Reserve near to the Prison and Willow Tavern, way back near Risdon Cove. 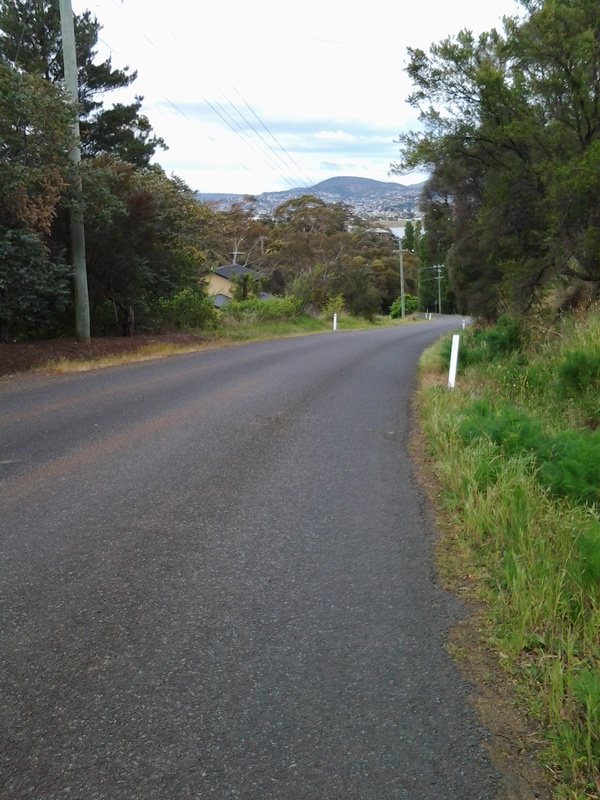 I reconnected with the East Derwent Highway at 11.22am, edged the road dodging rain spits, and continued walking northwards. 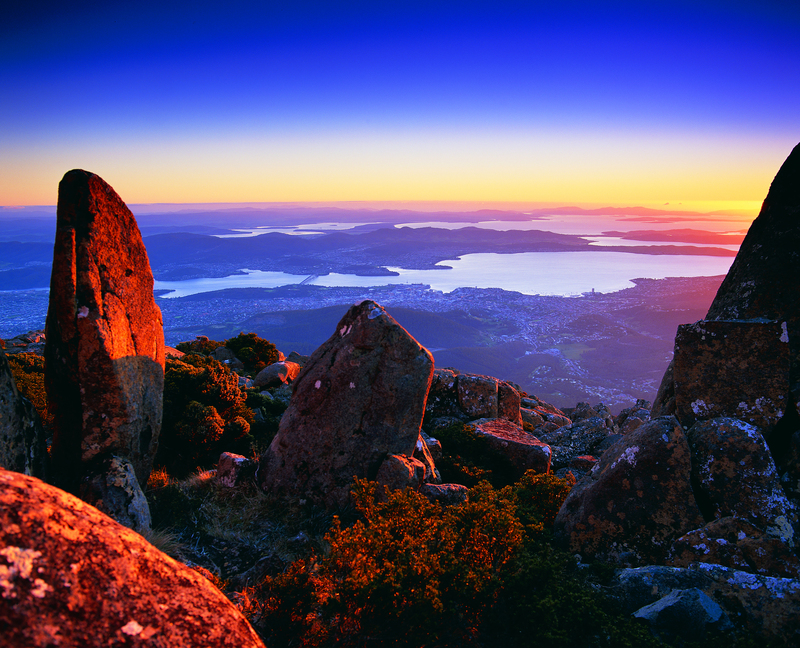 This entry was posted in Derwent River, Hobart, Mount Wellington, Walking and tagged East Derwent Highway, Joseph Conrad, Mount Direction, Mount Faulkner, Otago, Otago Bay, Otago Bay Road, Otago Cottage, Penenjou Bed and Breakfast, Risdon Dam, Westralian on November 4, 2014 by Tasmanian traveller.